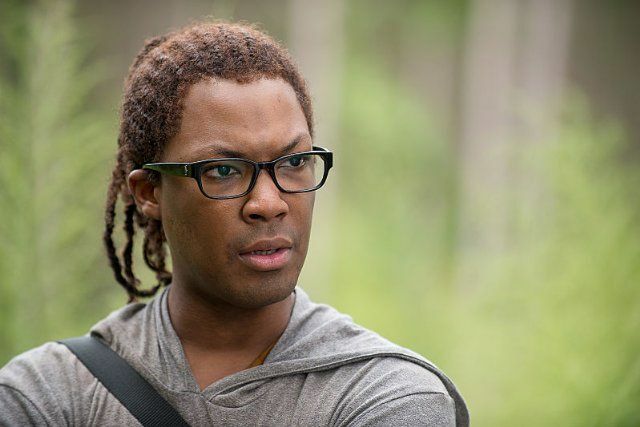 If we were to judge an episode by its title, last week’s hour of AMC’s The Walking Dead knocked it out of the park with “Knots Untie.” This week’s episode, “Not Tomorrow Yet”, struggled a bit in the title department but managed to bring us a solid story nonetheless. You can’t accuse the second half of season six of dragging its feet like some previous seasons. This thing is escalating on all fronts; threats, violence, and the cost of survival are all jumping up a notch. “Not Tomorrow Yet” rushes headlong into that firestorm. However, we don’t get the gut-punch of one of The Walking Dead’s most exciting, intense, and frenetic action sequences ever until the final few moments. The preceding three-quarters of the hour build tension between the Hilltop colonists and the Alexandrians while the central moral question–Is killing to survive acceptable, or is all life precious?–continues to plague some surprising members of Rick’s most loyal fellow fighters. Questions like these breed hesitation, and hesitation in this world has dire consequences. And yet it all starts out innocently enough. If you needed a reminder that the Alexandrians are suffering from a severe shortage of food, then Carol’s acorn-picking, cookie-baking montage should take care of that. There was a sweet memoriam when Carol left one of those cookies on Sam’s grave, but the most-talked about moment of the hour could very well be her kiss with Tobin. What the hell happened to #Caryl? Romantic entanglements aside, Carol’s personal journey in this episode is an interesting one. 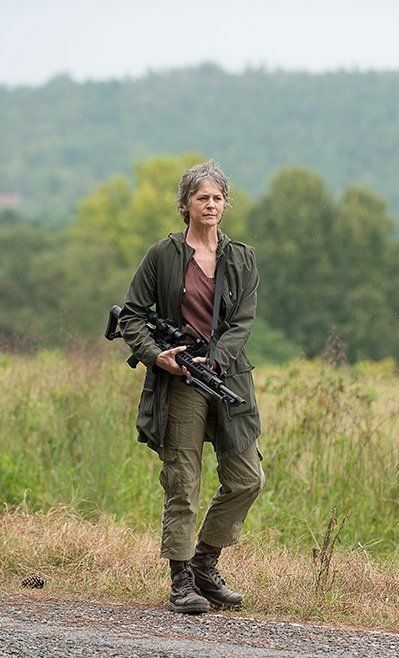 Melissa McBride’s character has gone through quite the dynamic arc since the early days of the season, evolving from a meek and abused housewife, to a capable fighter, to a hardened lone-wolf survivalist, to a convincingly deceptive double-agent of sorts within the walls of Alexandria. Carol’s been through quite a bit and is easily in the Top 5 of The Walking Dead’s most skilled survivors. So when it appears that she’s starting to get soft, to let her smokescreen role as a housewife get to her, or even hints that she’s coming around to Morgan’s “all life is precious” mantra, red flags for Carol’s safety should instantly go up. More on that in a moment. 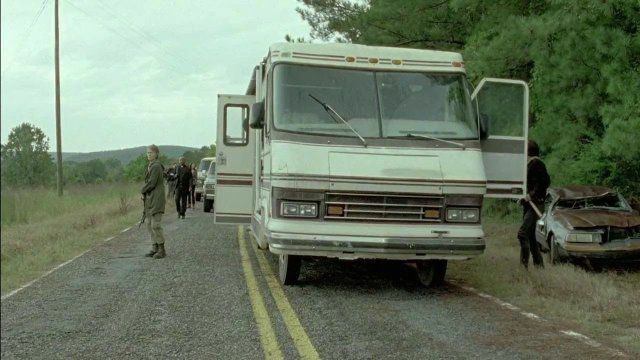 It wasn’t long before Rick and the gang returned from Hilltop with the RV loaded up with a month’s worth of food. There was little time to celebrate, however, since Rick rounded up the town’s leaders in the church to lay out the deal between Alexandria and the Hilltop colony. The food came with a price, one that required taking out the Saviors and their leader, Negan. Though Morgan was the only one to openly disagree with Rick’s plan to engage in bloody violence against the gang before the Saviors could do the same to Alexandria, it’s clear that not everyone is thrilled with the prospect of killing non-zombified men and women. Different folks took the news in their own way: Abraham stormed out on Rosita in the middle of the night and basically told her that she wasn’t good enough for him; Tara told Denise that she loved her but won’t hear it back until Tara returns from a two-week trip with Heath; and Rick and the others made their plan of attack thanks to a crudely drawn map from one of the Hilltop crew. The plan is to send him as a messenger with Gregory’s promised head in order to gain access to the Saviors’ stronghold and armory. The only problem: Gregory is very much alive. 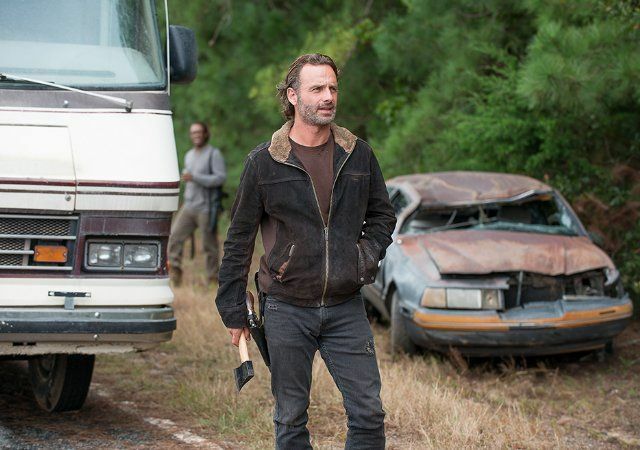 In a clever bit of storytelling, Rick’s convoy looks for a Gregory look-alike among Walkers in the woods in order to obtain a passable head to give to the Saviors. It’s darkly comic, but the real knock-out punch comes when Rick literally punches a Walker’s severed head in the face in order to make its decidedly non-Gregory-like nose look like a broken byproduct of the struggle to kill Gregory. 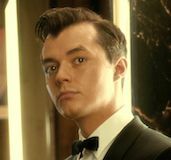 It’s one of the episode’s few moments of levity, albeit gallows humor, and it serves to break up the mounting tension rather well. Some of that tension is ratcheted up, however by Glenn and Heath, neither of whom have killed any living people before. The prospect, or the certainty, of having to do so weighed heavily on the both of them. Of equal concern on Carol’s part was Maggie’s presence on the perimeter; she’s pregnant and willingly put herself in danger, leaving Carol to stay behind with her as a protective measure. (I get that Maggie felt responsible for going on the mission since she negotiated the deal, but there’s a reason that diplomats have their responsibilities and soldiers have their own very separate duties.) There’s a lot of foreshadowing here, and as Rick’s strike team prepared to assail the Saviors’ stronghold, you just knew it was all about to blow up. Rick’s tactical, ruthless, and nearly flawless covert op on the Saviors is something we haven’t seen the team pull off before. They’ve done their share of sneaking around, doing recon, and taking out guards over the years, but this is the first time since the escape from Terminus that the team has looked this well-organized and synchronized. It didn’t hurt that the Saviors were presented as vulgar, violent, and lawless thugs, but it was still tough to watch the silent assassinations of the gangsters in their sleep as Rick’s team swept through the facility. Even Glenn was forced to kill a Savior, but having done so, prevented Heath from having to do the same … at least for a brief amount of time. When Abraham and Sasha missed a guard during their sweep, it allowed the Savior to pull the fire alarm and alert his fellows before he was put down. 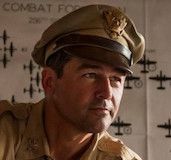 What followed was arguably the show’s most intense close-combat action sequence yet, at times so chaotic that it was difficult to tell just who was at the wrong end of the gun barrel. 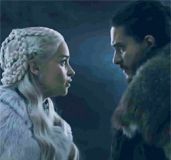 To make things even more frenzied, the well-edited sequence jumped back and forth between the battle inside the building and the reaction to those outside. 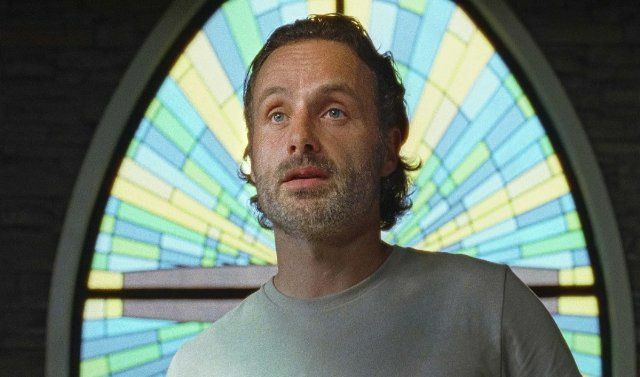 While Andy and the recently rescued Craig headed back to Hilltop to seal Alexandria’s end of the deal, Jesus disguised himself (barely) to assist Rick’s team. It’s a good thing he did, too, since he managed to save Glenn and Heath from one lone Savior they happened to miss during their bullet-spitting barrage using some newfound heavy weaponry. It was crazy, but even after presumably clearing the building, Rick & Co. soon realized it wasn’t over. Outside, in the daylight, the Alexndrians bid farewell to Heath and Tara who head off in the RV for their mission. 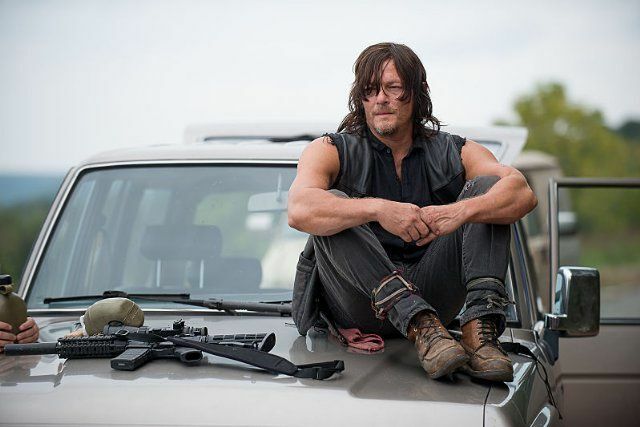 But it wasn’t long before Daryl was forced to take down a fleeing Savior who attempted to escape using Daryl’s own motorcycle–suggesting the man and woman Daryl met in the woods are either back with the Saviors or they’re dead. While drawing their weapons on the fallen fighter, a woman’s voice hailed Rick over a walkie talkie, a voice telling them to drop their weapons … because they have Carol and Maggie. 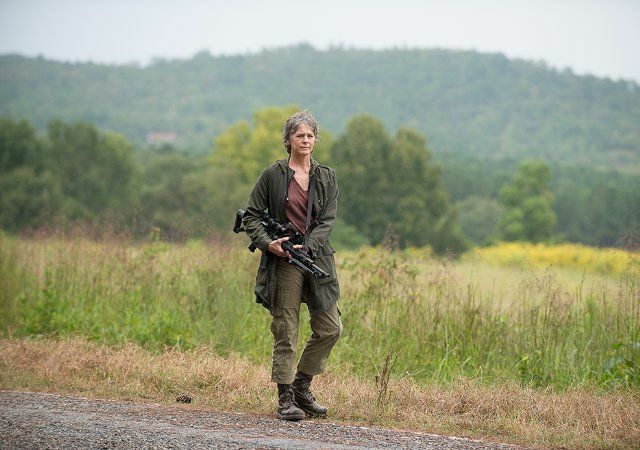 We can ask ourselves two questions here: Did Carol’s concern for Maggie and moral quandary over killing cause her to hesitate when faced with the Saviors? And was Maggie’s decision to be on the battlefield ever a good idea? We’ll likely find out the answer to the first question on next week’s episode, but I’m of the opinion that the answer to the second is a resounding, “No.” What’s also clear is that The Walking Dead is continuing to ramp up the threats facing our heroes and has set the opposing forces on an inevitable collision course that will almost certainly result in casualties on both sides. Rick and his team have struck a powerful blow, but who will be left standing when the dust settles? Anyone have the recipe for Carol’s Beet-and-Acorn cookies? Rick: “We don’t shy from it, we live. We kill them all.” Rick channeling The Governor here, a bit. The writing remains strong in this episode as the conversation turns from what they need to do to survive, to what they need to do to survive and stay human. 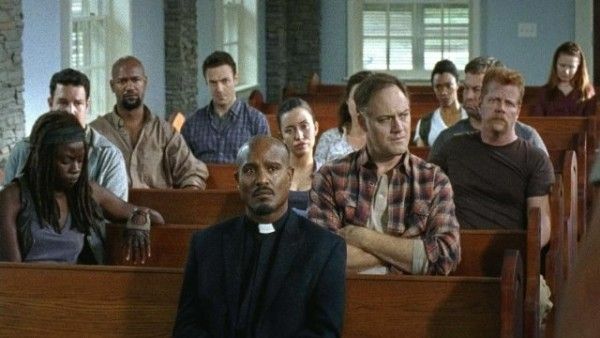 Tara: “You still a priest?” Gabriel: “Rick and Carl taught me about guns, other weapons, how to contribute. I’m still a priest.” I’m glad Gabriel’s pulling his own weight; he even had a good one-liner this week. What’s Morgan welding back in Alexandria? Is he making a jail cell like the Cheesemaker? And here’s Hozier’s “Arsonist’s Lullaby” to close out the episode.